Today… the most important thing you can do for your country all year. All it requires is a few clicks of your mouse. And it’s free. But it could make a massive difference to our way of life in Britain over the next 20 years. Yesterday we published our latest issue of London Investment Alert. It’s the first issue we’ve published since our newest analyst Boaz Shoshan joined Tim Price on the London Investment Alert team. I persuaded Boaz to leave his post as a financial adviser up in Scotland to come and join our team here on the Southbank. Together, Tim and Boaz have produced a razor-sharp – and shocking – analysis of what the election really means for investors. It comes down to four words: debt, lots of it. That’s the real meaning of the vote. And it’s going to have very real consequences for us all. Jeremy Corbyn’s surge – though unexpected in the political sense – was entirely logical when you consider he promised a lot of free stuff, to a lot of different people. Public sector pay rises. Nationalising industries like the railways. Free university education. More spending on the NHS and schools, and reinstating benefits that have been cut. Sounds great. Everyone loves free stuff. Except nothing in life is really free. All you can do is persuade other people to pay for you. You can take that money from people today, in the form of taxes. Or you can borrow it. Corbyn claimed it was the former, when really it’s the latter. The top 1% of taxpayers already pay 27% of all income tax. There isn’t a magical pot of cash sitting there waiting to be tapped. But wait! Corbyn didn’t win. No one did. Well, the Tories did, in a very narrow and technical sense. But the result of their weakness is that they have essentially abandoned their “austerity” plans. The idea of living within your means is out. Free stuff is in. And the sun is shining! Fire up the BBQ and forget about your children, they’ll probably be fine. Except of course, they probably won’t. The problem with stopping austerity (or attempting to live within your means), is that in reality we never really had any. Yes, there were cuts. But total government spending continued to rise. Sad to say, there has been no austerity whatsoever. Public sector debt as a percentage of GDP has, in fact, more than doubled since 2009. If this is austerity, I’d love to see extravagance. And extravagant public spending is exactly what we may see from Corbyn et al. Official UK debt now stands at more than £1.8 trillion – we will see £2 trillion in no time at all. But the official number does not account for taxpayer liabilities such as unfunded state and public pensions and nuclear decommissioning – taking these into account, the TaxPayers’ Alliance put the official liability the UK faces at £8.6 trillion. And that was in 2015 – I dread to think what that figure is now. That’s what the world of free gets you: austerity was a sham. But it felt “brutal” because spending is so out of control that even a small reduction in the rate of increase feels like a nightmare. Well, I’ll make a prediction for you right now. 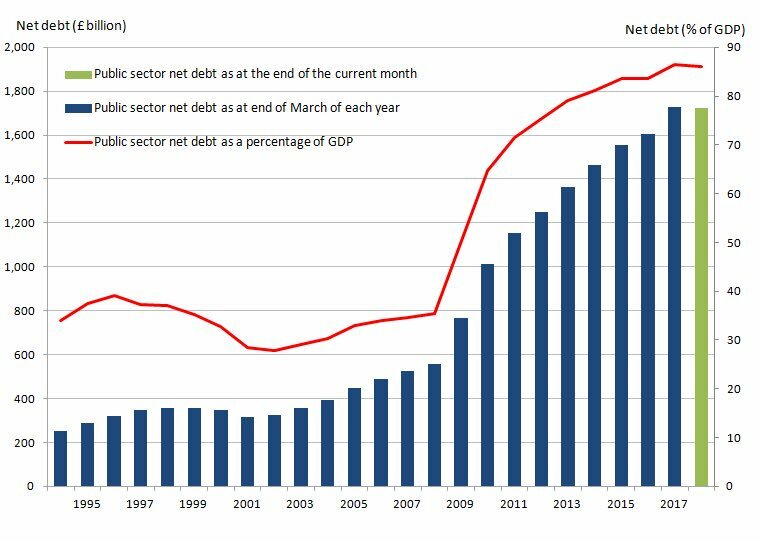 The UK’s national debt is going to crash through £2 trillion faster than anyone realises. Anyone suggesting we live within our means will be crucified at the polls. Our politicians will compete to offer as much stuff as they can. Conservatives, Labour, the Lib Dems – they’ll all do it. Public spending will explode. Our debts will spike. People will enjoy it… until they realise that our national finances are in an irredeemable mess. It’s easy to despair. That’s why Tim and Boaz have decided to do something constructive. They’re fighting back and they need your help. Their petition to the government to bring some sanity to public spending launches today. It may or may not work. But it’s important that someone stands for reason and gives people who’re worried about our vast and increasing debts can make themselves heard. UK government debt now stands above £1,700,000,000,000. This madness has to stop – we must protect our children from the price of this addiction to debt and overspending. Produce a clear plan to reduce the government debt and live within our means with a properly balanced budget. Legislate to introduce a debt ceiling to prevent our public debt increasing beyond £2 trillion. And you can sign it here. As well as your ideas, I think we also need some education and some discussion about what sound money is, and why governments should not be allowed to borrow and print. Central banks created this mess with ultra loose interest rates, and yet they are still in charge and go unchallenged, as they go from one mess to the next. We need a discussion about whether the British people deserve sound money, and if they do, why they haven’t got it. I don’t remember any manifesto where I voted for money printing, or for interest rate manipulation. So why does the government allow the central bankers to do this? I would support this, as I suspect would anyone with even the faintest understanding of public finances. I would add something about all manifesto commitments being independently priced alongside the independently costed measures that would be put in place to pay for said commitments. Any manifesto judged to not deliver the above will be independently communicated to the electorate. Ditto – all future budgets.